While air fryers allow you to cook healthier foods with little to no oil, the Elite Platinum Digital Air fryer goes further to deliver one of the best quality and results you can get from an air fryer in this modern age. You get to eat all of your favorite dishes without worries or fears as it does this without oil, reducing the fat content of your meals to the barest minimum. Check out our Elite Platinum Digital Air fryer reviews(Model EAF-1506D) to have full knowledge of this cutting-edge technology. The first thing that will strike you about this air fryer is its slickness and elegance. Just like the looks, the performance is out of the world. The Elite Platinum Air fryer technology uses super-heated hot air, circulating around the food to fry it, and it’s capable of doing this entirely with no oil. The food is crispy and delicious, just like deep frying but without the oil. It features easy to use digital controls and a handle that remains cool throughout the cooking process. 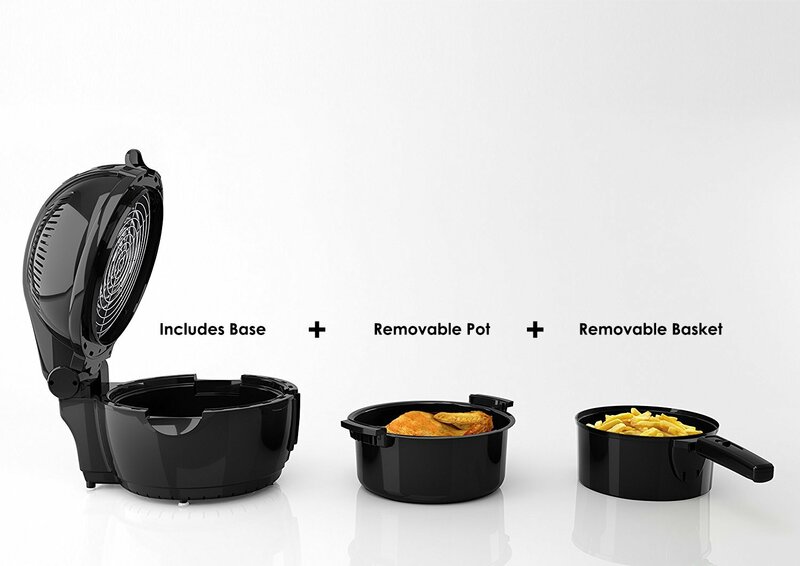 The removable pan and frying basket are both non-sticky and dishwasher safe. The air fryer has a lot of features that set it head and shoulders above the rest, why not check out our Elite Platinum Air fryer reviews below to learn more, from the capacity and sizes to all the other features and the downsides, if at all there is any. Elite Platinum Air fryer 3.2qt: This has a non-stick removable pan and a frying basket of 3.2qt that can hold up to 2lbs of food at a single batch. It has a weight of 9.9lbs and a dimension of 11.2 x 11.6 x 12.4 inches. Elite 3.5qt Digital Air fryer: This model has a 3.5qt size frying basket and a non-stick pan that can hold up to 2.2lbs at a single batch. It weighs 14.3lbs and has a dimension of 14.1 x 13.2 x 17.1 inches. Elite Platinum Digital Air fryer 5.5qt: This size has the capacity to hold up to 4lbs at a time, also with a non-stick removable pan and frying basket. This has a slightly lower weight of 12.1lbs and a dimension of 12.2 x 15 x 14.6 inches. It all comes down to your choice to select whichever size suits you, whatever you want, you are covered. If you care about eating healthy and safe, getting an air fryer is non-negotiable. However, to get the best results from air frying, you would need an air fryer like the Elite Platinum Air fryer, so your hope and longing for a crispy and delicious oil-free meal is not dashed. The Elite Platinum Air fryer has a lot of stand-out features. You’ll ask yourself if you won’t be needing this after checking out these features. Easy to Use: It features easy to use adjustable digital LED controls to simplify your cooking experience. The frying basket and pan are also removable and can be easily disassembled and reassembled for quick and easy use. Easy to Clean: The pan and frying basket are both removable and non-sticky. Also, they don’t get too messy because there is no splatter from oil used in cooking. These simple facts have made the Elite Platinum Air fryer one of the easiest to clean and easiest to use air fryers in the market. It should also be known that these parts are dishwasher safe and do not pose any problem when you toss them in water for cleaning. Safety: The Elite Platinum Air fryer has an inbuilt safety mechanism in form of an automatic timer that shuts off after 60 minutes of inactivity, you can even visit the cinema while a crispy and delicious meal of chicken nuggets awaits your arrival at home, would you really? You are on your own! Your food does not get burnt and you do not ever have to worry about overcooking. Versatility: With 6 preset options, you can decide to cook various dishes apart from the primary air frying, this is not a common feat among many other air fryers. Temperature Control: You have the option to select a temperature range between 180 to 400F to meet cooking requirements for various dishes. Oil-free Cooking: With the Elite Platinum Air fryer, you do not have to worry about too much fat or calories from excessive frying with oil as in deep frying. You eat healthy, the same crispy and delicious meal, no oil, no fat, no worries and no guilty feeling. A recipe book for more than 25 different recipes. However, you could purchase a few other accessories on Amazon for special use. The air fryer is designed for quick and easy use. Remove the pan and load the food to be air fried. Slot it back in and select a preset function or your own preferred time and temperature. Wait a few minutes and enjoy a healthy and delicious meal. Digital controls make it easy to use, you can set your preferred time and temperature. The removable, non-sticky parts make it both easy to use and clean as well. It gets your food done healthier and faster. Auto shut-off and overheating protection ensure the safety of your food and the air fryer itself. 6 preset options save time and efforts from poring over pages of a cookbook. It has the ability to perform other cooking processes apart from air frying, steaming, baking, roasting and much more. Considering the price of many other air fryers, the price is at the high end. It comes only in black color. Verdict – The Elite Platinum Air fryer, bar the steep price, is a great option that will fulfill your air frying needs. It does not disappoint and is definitely going to wow you with its excellent performance. This Elite Platinum Digital Air fryer reviews would be incomplete without a concluding part. 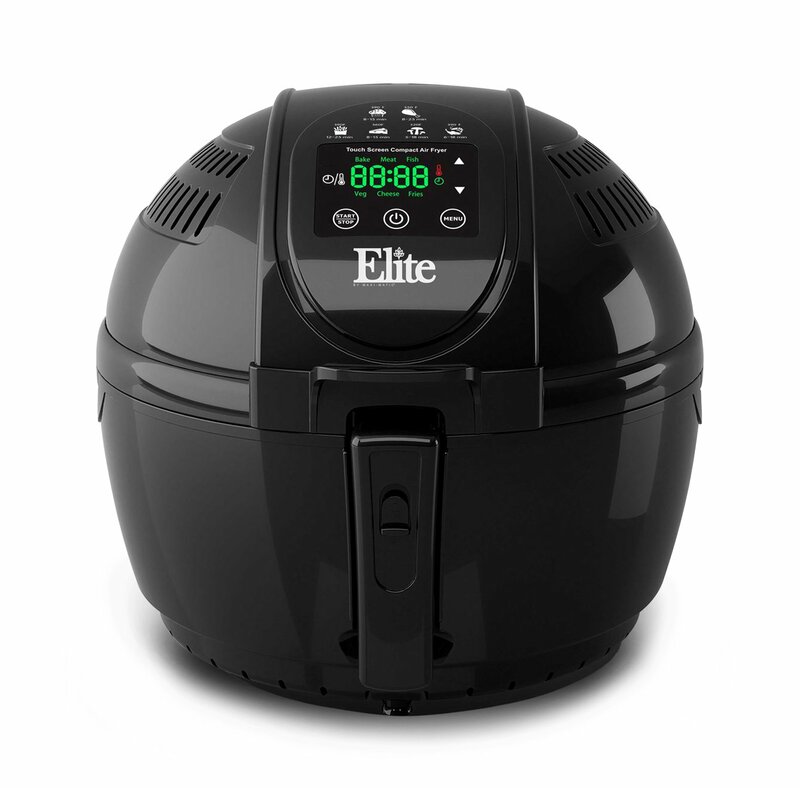 The Elite Platinum Air fryer would reduce fat content in foods by as much as 80%. If you haven’t, the time to start caring about the safety and health implications of what you eat is now. With this beautiful piece of technology, you could get a crispy and delicious meal and also care less about the unhealthy fat and calories. What else are you waiting for? Make the move today and start enjoying your favorite fried dishes without worries.